Craig Levein has admitted he is unsure if Hearts forward Steven Naismith will be fit for Monday night’s William Hill Scottish Cup quarter-final clash with Partick Thistle. The 32-year-old was replaced at half time as the Jambos went down 2-1 to league-leaders Celtic in the Ladbrokes Premiership clash at Tynecastle last night and while the Hearts boss was hopeful his talisman would be available for the clash at the Energy Check Stadium at Firhill next week, he couldn’t say for sure if the on-loan Norwich City man would be fit for the tie. Naismith missed nearly two months after sustaining an injury in the Betfred Cup semi-final defeat to Celtic at BT Murrayfield in late October. He returned in a 2-0 loss to Aberdeen at Pittodrie just before Christmas. The Scotland international is a key man for Hearts, and has scored eight goals this season. His presence in the starting line-up, or at the very least the match-day squad, would be a big boost for a side aiming to reach their second cup semi-final of the campaign. 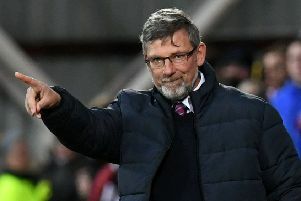 Levein feels there was enough in his side’s battling performance against Celtic to suggest that Hearts can “really compete with everybody again”. He added: “We competed with the team that is recognised as the best in the league. “There were some good performances by players who have had injury problems and have struggled to get right back to their best, which gives me a fair bit of pleasure, because I feel that’s them back to where they were previously. “We have a few problems defensively with injury again, but we can cope with that. “We got to the semi-final of the Betfred Cup and lost Steven in the first minute of the match (against Celtic), which made it extremely difficult for us. But the experience of getting there was good.